We offer amenities such as our Toyota-Certified Master Technicians, Toyota Rental Cars, a state-of-the-art lounge, shuttles and many local attractions surely to fit your needs. Our experts use high-tech equipment and up-to-date technology to ensure that your vehicle is getting the quality it deserves. Sales and service were amazingly patient and answered all my questions. Clean and we'll maintained Veteran owned business. As soon as I see a certified vehicle I would buy. I went to A LOT of dealerships, and this place was hands down the best experience. Not pushy. Offered most for my trade right away. I will try my best to buy my next car, in two years, from Gordon! I contacted this dealership online regarding a used car. They promptly answered all of my questions, and sent over additional photos when requested. I didn't feel pressured like you typically get from other vehicle sales people. I am from out of town and traveled 6 hours to get the vehicle, and they made sure it had a full tank and that any of the dings in the windshield were treated before sending me on my way with my dream vehicle. AJ was attentive and patient with me and had everything ready for me when I arrived. Thank you Mungenast Alton Toyota, and specifically AJ C, and Kevin S for your excellent customer service! Leave us a Review on Social Media! At Mungenast Alton Toyota we are proud to offer the exciting all-new Toyota lineup, including the latest Toyota Camry, Corolla, Prius, Highlander, RAV4, Tundra and many more. We encourage you to visit our new Toyota dealership serving Florissant MO, Edwardsville IL and Godfrey IL to explore our Toyota car, SUV, truck and van inventory, and to set up a test drive in the model that best interests you! Our professional sales team is committed to helping you find your next new or used car in Alton and look forward to working with you to ensure complete satisfaction. 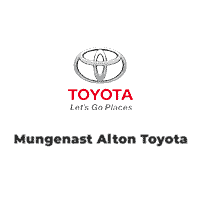 Mungenast Alton Toyota also provides drivers from the Florissant MO, Edwardsville IL and Godfrey IL area with a great selection of used cars in Alton, IL. Browse our pre-owned vehicle inventory online or swing by to view them in person. We have used cars in Alton by Toyota and other top manufacturers to match various driving styles. Feel free to give us a call if you have any questions! If you can’t find exactly what you are looking for, use our online car finder form to allow us to do the searching for you. It’s likely that with any new Toyota or used car purchase, you’ll be interested in options for auto finance in Alton that will best suit your current needs, be it for auto loans in Alton or a Toyota lease near Florissant, MO. The Mungenast Automotive Family of dealerships has the ability to help out in almost any situation, starting with Toyota Financial Services. We offer a great selection of options for car financing in Alton and our finance team with will work hard to get you a great car loan from Alton or Toyota lease near Florissant, MO that will surely fit your budget. To get the process started, simply fill out our online finance application.